With 1.6 billion websites out there, 10,000 new sites every hour, and more than 70 million business pages on Facebook, just how do you cut through the clutter to find your customers? We caught up with Naomi Simson – one of Australia’s most accomplished businesspeople, a tech pioneer with a marketing background (it’s a winning combination), a Linkedin influencer with more than 2.5m followers, a blogger, speaker and popular author, and the #redshark investor from TV – to hear how she did it for herself and is now helping other businesses find their way with artificial intelligence marketing platform Albert. Best known as the founder of one of Australia’s most successful tech companies, online experience retailer RedBalloon, Naomi now has five distinct brands with business partner David Anderson under their Big Red Group which launched July 2017. There’s RedBalloon (launched 2001); employee recognition and reward software Redii (launched 2015); online unique gift retailer Wrapped (launched 2016); free peer-to-peer business support Facebook community The Huddle (launched 2017); and digital marketing business Marketics (also launched 2017). One reason RedBalloon will grow significantly 2017-2019 is the use of the world’s first and only artificial intelligence marketing platform, named Albert. This revolutionary software mines through huge amounts of data to extract insights and execute paid and non-paid digital campaigns across multiple channels, in real time. He requires little human manipulation, is proactive, highly intelligent, learns as he goes, and can turn out results like no human expert. He’s the ideal employee for many businesses. After first hearing about Israeli-developed Albert in the Shark Tank Australia green room last year, she quickly took action. Naomi deployed Albert for RedBalloon in June 2017 and within 24 hours he had identified and 6,400 keywords and executed ads on the fly. To put that in perspective, that would have taken a human SEM expert close to one year. For the bottom line, Albert was able to reduce the cost of acquiring a customer to RedBalloon by 25% in the first month. Naomi was convinced, and in July 2017 Big Red Group secured the exclusive rights to resell Albert within Australia and New Zealand. From June 2017 to April 2018, Albert reduced RedBalloon’s cost of acquiring a customer from $48 to $7. It’s no wonder Albert has become a ‘secret weapon’ for many businesses. “We’re very happy with the uptake,” says Naomi. “I think Australians like innovation, you know, they love trying new things and that’s why people love Shark Tank. That idea was RedBalloon – an online gift retailer selling experiences over physical gifts. The branding was spot on, and the customer service was designed to be an experience in itself – even the gift was delivered with red helium balloons. The marketing landscape was very different at the start of the millennium; smart phones didn’t exist, Google Adwords had only just launched in the US and was still a few years off launching in Australia (in fact, Google itself was only born late 1998), SEO was still really in its infancy, social media as we know it didn’t exist (no Linkedin, Facebook, Instagram, Twitter or YouTube). ‘Digital marketing’ was very immature, and many dot com businesses failed in those early years because they couldn’t attract customers. “The way we actually grew was through brand association,” recalls Naomi. “American Express, which is all about experiences for their members, chose us to be in their catalogue which they mailed to a million members; and that gave us a brand authority. After 15 months, Naomi knew RedBalloon had legs. She closed Bright Marketing, and RedBalloon continued to soar. Today, RedBalloon has delivered to four million customers, and boosted millions of small businesses by connecting customers with their experiences. Shark Tank Australia returned to our screens in May (Tuesday nights on Ten), marking Naomi’s fourth season as an investor. Over the show’s four seasons, Naomi and her fellow sharks have made investment offers totalling just shy of $20m in Aussie businesses looking for growth and guidance. However, not all deals we see offered on TV happen, as there is a due diligence process after the cameras stop rolling. No matter what, each business gets incredible value and mentorship. Of Naomi’s many Shark Tank businesses, some stand out successes have been: The Ectoplane; the award-winning self-contained raised garden bed Vegepod; the clever little clothes pegs that include hooks for clothes hangers Hegs; and this season’s Inappropriate Gift Company, and Dessert Boxes. Naomi of course says choosing a favourite is like choosing a favourite child – she just can’t do it. Why does Naomi invest in businesses, speak professionally, blog frequently, offer courses in brand-building and facilitate a Facebook community committed to peer-to-peer business support? Because she knows how lonely, and scary, small business can be at times. And because she had fantastic mentors throughout her life, but understands not every entrepreneur does. Growing up in Melbourne in middle-class Australia, Naomi wasn’t short of good role models. Her father Doug Elms was a mechanical engineer, who started a business from the family home when Naomi was in uni. Her mother Lorna Elms worked in computing since Naomi can remember. Both parents worked, both parents did domestic and parenting duties – it was a very modern approach for the ‘60s and ‘70s. By the time Naomi was at uni, Lorna was working as a systems analyst for one of Australia’s great entrepreneurs, Lyndsey Cattermole (Aspect Computing). Naomi saw firsthand both Lorna and Lyndsey achieving accomplished professional careers. “My mum would take me to work events and say, ‘look at Lyndsey; if she can do it, you can do it’. With five brands, three books, frequent blogging on her own website, Linkedin and as a contributor to high-profile blogs, and a professional investor, Naomi has certainly worked hard and stuck at it. While her businesses can no longer be described as “small” Naomi’s focus is still around supporting small businesses; whether that is a tour operator in far north Queensland, a day spa in Sydney or wine tour in Adelaide, an artisan retailer or a business owner wanting to reward and recognise employees. Each of her brands give the infrastructure and support to small and medium businesses. Her business story is certainly inspiring, but the future of marketing is fascinating; and Naomi is right there at the leading edge, welcoming what will happen next. 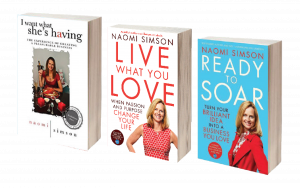 For business advice, branding tips and marketing insights, go to Naomi’s website, Linkedin, or join The Huddle via naomisimson.com.